Update 19 Sept 2011 - The Lib Dem Motion "Protecting Individuals and Communities from Drug Harms" was passed by conference, and is therefore now Lib Dem Party policy. Watch the full conference debate you tube here. The Lib Dems have long held the most reasonable, evidence based drug policy of the three biggest UK parties, and if passed, their latest drugs motion would build on that history in grand style. At its heart is a call for a rather dull sounding “Impact Assessment” of the Misuse of Drugs Act 1971 (MDA) by an independent panel, to compare all the costs and benefits of the current approach to drugs with alternatives, such as Portuguese style decriminalisation of possession, and models of legal regulation including for cannabis, and Swiss-style heroin prescription. This is an eminently sensible approach that would allow future drug policy to be based on evidence of what works, rather than political rhetoric or tabloid fever. But make no mistake – it would be truly groundbreaking. Firstly, none of the many previous reviews of drug policy have done this kind of comprehensive comparison. (In the US, the Drug Czar’s Office is actually banned from doing research that might show benefits from legal regulation.) Secondly, it would also be far harder to ignore because it would have been Government initiated, originate from Lib Dem Party Policy, and be of huge public interest, like the recent Banking Review. Yet an Impact Assessment of this kind is not radical - it is the gold-standard approach for assessing public policy the world over. In fact, if the Misuse of Drugs Act were introduced today it would be required to have one carried out on it in advance of enactment, and after 3-5 years to see if it is actually doing what it was intended to. This has been a requirement for all Acts of Parliament since 2005 for the very good reason that laws often have unintended consequences, and it makes sense to assess whether they outweigh the benefits. And if there is one thing everyone agrees about in drug policy it is that the MDA (and similar legislation in other countries) was not intended to create a huge criminal market; undermine international development and security; increase health harms including HIV/AIDS; promote stigma and discrimination; lead to deforestation and pollution, and undermine human rights all over the globe (see countthecosts.org for details). Yet even the UN Office on Drugs and Crime, which oversees the system of global prohibition, acknowledges it has created all these ‘unintended consequences’. Would such an Impact Assessment be possible? Despite what the current and last Government have said, yes it would be – which is why the European Commission is starting one looking at different approaches to controlling new synthetic drugs - so-called ‘legal highs’. What if there are gaps in the research base? Then one of the key things an IA can do is identify them and provide guidance in prioritising which gaps should be filled first, and which are not crucial to forming an overall conclusion. That is why an Impact Assessment approach is endorsed by a range of NGOs and academics from various sectors affected by drug policy, and politicians from all parties, including the Conservative Peer and Professor of Government Lord Norton, who was the prime mover in making Impact Assessments obligatory for all new Acts. Impact Assessments may not make for great sound bites or lurid tabloid headlines, but they do result in better policy, and at a time of severe cuts, there is a pressing need to ensure all public spending is as effective as possible. This motion is also timely. Globally, the tide has turned, and ever more prominent statesmen and women are calling for an end to the failed war on drugs and its replacement with models of legal regulation based on science, public health and human rights principles. Those voices now include the former Secretary-General of the UN Kofi Annan, seven former Presidents including of the US, Mexico, Brazil, Colombia, Honduras and Switzerland, and the current Prime Minister of Greece, not to mention senior doctors, police, academics and religious leaders. In response, the Tory and Labour frontbenches continue shouting; “Drugs are bad for you, ban them” whilst refusing to explore different approaches – even when shown to work in other countries. That is not principled leadership, and looks increasingly irresponsible. The Lib Dem motion is only part of a much broader, growing global campaign for a full review of the War on Drugs, and all the alternatives. 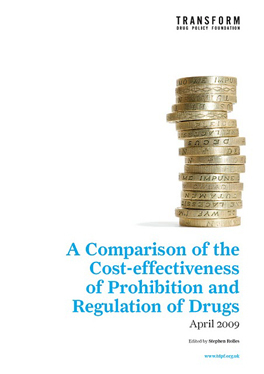 The War on Drugs: Count the Costs project (www.countthecosts.org) was launched this year to mark the 50th Anniversary of the UN Convention that underpins the current approach. It is bringing together groups and individuals from every sector affected by drugs, and every region. We might have a range of views on what we should do about drugs, but we share a commitment to make the world a safer, healthier place. As a result we also share one simple aim – let’s count the costs of the war on drugs and explore the alternatives, so we can base drug policy on evidence of what works. And an Impact Assessment of the UK Misuse of Drugs Act would be an excellent place to start. 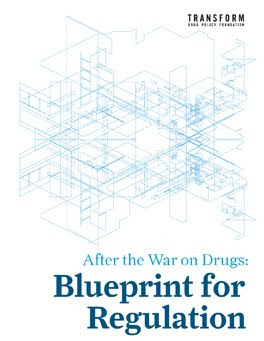 With the ever increasing importance of Latin America to both the debate around drug policy, and the politics of ending the failed drug war, Transform is pleased to announce the Spanish translation (PDF) of our book 'After the War on Drugs: Blueprint for Regulation'. We are also delighted to announce it has a new foreword by César Gaviria, former president of Colombia, and member of the Global Commission on Drug Policy. Transform's Head of External Affairs, Danny Kushlick, is currently in Mexico, at the III Conferencia Latinoamericana y I Conferencia Mexicana sobre Políticas de Drogas, promoting the translation of the book, along with the new Spanish Count the Costs website and briefings. We are on the brink of a substantial shift in international drug policy that will transform the entire globe. After decades waiting in the wings, alternatives to prohibition are now firmly on the negotiating table for discussion. The media’s overwhelmingly positive response to the report from the Global Commission on Drug Policy, (on which I am proud to have sat as a member), has shown that there is a big appetite for change. This Spanish translation of ‘After the war on Drugs – Blueprint for Regulation’ is so relevant now because of the overwhelmingly catastrophic impacts of the war on drugs in Latin America, but also because there now exists here an appetite for progressive reform. In the last year the presidents of both Colombia and Mexico have called for an evidence based discussion of alternatives, including legal regulation. When it happens, the shift to legal regulation will result in major benefits for states significantly involved in production, transit and consumption of currently illegal drugs. However, the positive repercussions will ripple out far wider and ultimately will bring benefits for all of us – increasing security, promoting development, bolstering democracy and upholding human rights. All of which are close to my heart, from my time as Secretary General of the Organisation of American States, of which these policy principles form the four pillars. However, it is not all plain sailing. The US has led other UN member states to object to Bolivia’s request to amend the UN Single Convention to allow indigenous coca chewing, because they claim it would jeopardise the ‘integrity’ of the 1961 UN Single Convention on drugs. ‘Integrity’ implies that the overarching system of drug control is “unimpaired, sound, essential and complete”. Every report on drugs from the last ten years shows this to be very far from the truth. None has gone anywhere near giving the current regime a clean bill of health, and in fact most have questioned both its underlying principles and its outcomes, including those from the UN Office on Drugs and Crime itself. It would be more apt to describe the current system as ‘corrupt’, in its original sense, meaning rotten and broken. From its conception the UN drug control system has been split in two. In 1961 the Single Convention on Drugs formulated a strict system of regulation on the production, supply and use of drugs for medical use, whilst at the same time constructing an absolute global ban for non-medical production, supply and use. These control regimes produced two very different markets – one regulated by governments and subject to international trade agreements, the other run by organised criminals, insurgents, paramilitaries and corrupt officials, completely beyond the control of governments or supranational agencies. It is this latter market that afflicts states as far apart as Afghanistan – where the rule of law is significantly undermined by their involvement in opium production, Colombia – whose governance is compromised by the catalysing influence of cocaine in supporting the activities of insurgents, paramilitaries and parapoliticians, Guinea Bissau – where the fragile state collapsed into a narcostate when it became part of the new cocaine transit route, and Mexico – where turf war violence has led to tens of thousands of the most horribly violent deaths in the last few years. And yet, at the same time, legal cocaine is produced for the medical market, without undermining regional or global security, and opium is grown all over the world for both pain control and for the treatment of addiction, without undermining development in fragile states or contributing to crime and criminality. The only conclusion we can draw from these contrasting examples is that it is the control regime that determines the efficacy of the outcomes. The opium poppies swaying in the breeze in fields in India, Tasmania and the UK will travel a vastly different route than those grown in the fields of Southern Afghanistan. As this ‘Blueprint’ demonstrates in some detail, drug regulation is anything but a step into the unknown. The parallel, legally regulated drug market has a long history and a robust evidence base that shows both its strengths and its weaknesses. One lesson we must learn from our experience is that governments must intervene with more vigour in the alcohol and tobacco markets. Multi-national companies that hold profitability as the highest priority are unlikely to hold their customers’ health in the highest regard. No one with a serious interest in the needs of the disadvantaged and vulnerable would countenance the free sale of heroin from unlicensed vendors, (as is currently the case for tobacco). ‘After the War on Drugs – Blueprint for Regulation’ describes three basic options for government regulation – prescription, pharmacy dispensing and licensed sale. Given that the UN estimates that there are up to 250 million users of illegal drugs, it is perverse in the extreme to leave the trade that supplies them, in the hands of organised criminals and unregulated dealers. The world needs, and deserves, a control regime that is not corrupt, that has genuine integrity – that is sound, complete and whole – that is democratic, and delivers security, development and health within a human rights framework. I am realistic. I believe it could take another ten years to turn this ‘Blueprint’ into reality. It is a tragedy that in the next decade many thousands more will die using dirty drugs or trying to stop, or fighting over the spoils of, the illegal trade. At the same time we will collectively waste another trillion dollars on the global war on drugs. But positive steps in the right direction are already underway and public support for reform increases inexorably. Decriminalisation of drug users is gaining ground in several Latin American countries and experiments with the legal regulation of cannabis are almost certain to start in several places within a few years time. I commend readers of this book to pass it on to politicians who have the power to implement its conclusions. It will prove an invaluable resource for those seeking an exit strategy from the drug war and a solid foundation for peace and security in Latin America and beyond. Nos encontramos al borde de un significativo cambio en cuanto a políticas internacionales sobre drogas, un cambio que transformará todo el planeta. Tras décadas de esperar su turno por salir a escena, las alternativas a la prohibición se encuentran ahora firmemente colocadas en la mesa de negociaciones para ser discutidas. La respuesta abrumadoramente positiva de los medios de comunicación al informe de la Comisión Global sobre Políticas de Drogas (a la cual me enorgullezco de pertenecer), ha mostrado que existe una enorme sed de cambio. Esta traducción al español de “Después de la Guerra contra las Drogas – Una Propuesta para la Regulación” es tan relevante ahora debido a los abrumadoramente catastróficos impactos de la guerra contra las drogas en América Latina, pero también porque ahora existe aquí gran entusiasmo por una reforma progresista. Durante el último año, los presidentes tanto de Colombia como de México han formulado llamados por una discusión basada en evidencias sobre estrategias alternativas, incluyendo la regulación legal. Cuando ocurra el cambio hacia la regulación legal, éste resultará en importantes beneficios para los países que se encuentran involucrados de manera significativa en la producción, tránsito y consumo de drogas actualmente ilegales. Las repercusiones positivas, sin embargo, se expandirán mucho más allá de estos países y, en última instancia, nos beneficiarán a todos – incrementando la seguridad, promoviendo el desarrollo, reafirmando la democracia y ratificando los derechos humanos. Todos estos valores los llevo muy dentro de mí, desde la época en que fui Secretario General de la Organización de Estados Americanos, cuyos cuatro pilares coinciden con estos principios de política. Éste no será, sin embargo, un recorrido sin tropiezos. Los EE.UU. han llevado a otros Estados miembros de la ONU a objetar la solicitud de Bolivia de enmendar la Convención Única sobre Estupefacientes de las Naciones Unidas para permitir que poblaciones indígenas mastiquen hoja de coca, afirmando que ello amenazaría la “integridad” de la Convención Única de 1961. “Integridad” implica que el sistema global para el control de drogas es “intacto, sólido, esencial y completo”. Cada informe sobre drogas de los últimos diez años muestra que ello está muy lejos de ser cierto. Ninguno de estos informes ha llegado al punto de afirmar que el régimen actual está libre de problemas y, de hecho, la mayoría de estos reportes, incluyendo aquellos elaborados por la propia Oficina de las Naciones Unidas sobre las Drogas y el Delito, cuestionan tanto los principios subyacentes como los resultados de este régimen. Sería más apropiado describir el sistema actual como “corrupto” en el sentido original del término, que significa podrido y dañado. Desde su concepción, el sistema para el control de drogas de la ONU ha estado escindido en dos. En 1961, la Convención Única sobre Estupefacientes formuló un estricto sistema de regulación sobre la producción, suministro y consumo de drogas para uso médico, mientras al mismo tiempo construía una prohibición global absoluta para la producción, suministro y consumo de drogas no médicas. Estos regímenes de control produjeron dos tipos de mercados muy diferentes – uno regulado por los gobiernos y sujeto a acuerdos comerciales internacionales; y el otro manejado por organizaciones criminales, insurgentes, paramilitares y funcionarios corruptos, ubicado completamente fuera del control de los gobiernos y las agencias supranacionales. Es éste último mercado el que está afligiendo a países tan distantes como Afganistán – donde el Estado de Derecho ha sido significativamente socavado debido a su participación en la producción de opio; Colombia – cuya gobernabilidad está comprometida por la influencia catalizadora de la cocaína en apoyo de las actividades de subversivos, paramilitares y parapolíticos; Guinea Bissau – donde el frágil Estado colapsó para convertirse en un narco-Estado al volverse parte de la nueva ruta para el tránsito de cocaína; y México – donde la violencia de la lucha interna por el control de territorios ha producido decenas de miles de los asesinatos más espantosamente violentos perpetrados en los últimos años. Y sin embargo, al mismo tiempo, se produce cocaína legal para el mercado médico sin socavar la seguridad regional o global, y se cultiva amapola en todo el planeta tanto para controlar el dolor como para tratar adicciones sin socavar el desarrollo en Estados frágiles ni contribuir a la delincuencia y la criminalidad. La única conclusión que podemos extraer de estos ejemplos contradictorios es que lo que determina la eficacia de los resultados es el régimen de control. El viento que hace balancear los cultivos de amapolas opiáceas en la India, Tasmania y el Reino Unido, les lleva por una ruta diametralmente distinta a la trazada para los cultivos de la misma planta en el sur de Afganistán. Tal como la presente “Propuesta para la Regulación” demuestra en detalle, la regulación de las drogas no es en absoluto un paso hacia lo desconocido. El mercado paralelo de drogas, legalmente regulado, tiene una larga historia y una sólida base de evidencias que muestra tanto sus fortalezas como sus debilidades. Una lección que debemos recoger de nuestra experiencia es que los gobiernos deben intervenir con más vigor en los mercados de alcohol y tabaco. Es improbable que compañías multinacionales cuya máxima prioridad es la ganancia, tengan mucho respeto por la salud de sus clientes. Ninguna persona seriamente interesada en las necesidades de las personas desfavorecidas y vulnerables toleraría la venta libre de heroína por parte de vendedores sin licencia (tal como ocurre actualmente con el tabaco). “Después de la Guerra contra las Drogas – Una Propuesta para la Regulación” describe tres opciones básicas para regulación por parte del gobierno – prescripción, venta a través de farmacias y venta con licencia. Dado que la ONU calcula que existen cerca de 250 millones de consumidores de drogas ilegales, resulta extremadamente perverso dejar el comercio que les proporciona estas sustancias en manos de criminales organizados y traficantes exentos de regulación. El mundo requiere y merece un régimen de control que no sea corrupto, que tenga una genuina integridad – que sea sensato, completo y cabal – que sea democrático, y que ofrezca seguridad, desarrollo y salud en un marco de derechos humanos. Soy realista. Creo que podría tomar otros diez años convertir esta “Propuesta” en realidad. Resulta trágico que en la próxima década muchos miles de personas más deban morir consumiendo drogas sucias o tratando de dejarlas, o disputando el botín del tráfico ilegal. Al mismo tiempo, colectivamente desperdiciaremos otro billón de dólares en la guerra global contra las drogas. Sin embargo, ya se están dando pasos positivos en la dirección correcta, y el apoyo del público hacia la reforma crece inexorablemente. La descriminalización de los consumidores de drogas está conquistando terreno en varios países de América Latina, y es casi seguro que dentro de pocos años empiecen experimentos con la regulación legal de cannabis en varios lugares. A quienes lean este libro, les encomiendo que lo hagan llegar a los políticos que tienen la autoridad para implementar sus conclusiones. Este libro resultará ser un recurso invalorable para quienes busquen una estrategia para escapar de la guerra contra las drogas, y una base sólida para lograr la paz y la seguridad en América Latina y en otras latitudes. Today the War on Drugs: Count the Costs Campaign (La campaña Guerra Contra las Drogas: Calcula los Costos) will be launched in Latin America, alongside the newly translated Count the Costs website and briefings - now available. Danny Kushlick of Transform Drug Policy Foundation (UK) will outline the many costs of the war on drugs, and the aims of the campaign, followed by a screening of the film Cocaine Unwrapped at the III Conferencia Latinoamericana y I Conferencia Mexicana sobre Políticas de Drogas in Mexico City. La campaña “La Guerra Contra las Drogas: Calcula los Costos” reunirá a actores involucrados de todo el mundo, incluyendo a OSC, gestores de políticas y otros, cuyo trabajo es impactado negativamente por el tratamiento legal a las drogas. Juntos harán un llamado a los gobiernos y agencias internacionales para evaluar intensamente las consecuencias colaterales de la Guerra contra las drogas y explorar alternativas basadas en evidencias. La “guerra contra las drogas” en una opción de políticas. Existen otras opciones que deben, como mínimo, ser debatidas y exploradas, valiéndose de las mejores evidencias y análisis que se puedan reunir. Todos compartimos las mismas metas – lograr un mundo más seguro, más saludable y más justo. Por ello, los abajo suscritos hacemos un llamado a los líderes del mundo y las agencias de las NN.UU. para cuantificar las consecuencias negativas no intencionales del enfoque actual hacia las drogas, y evaluar los costos y beneficios potenciales de enfoques alternativos. Danny Kushlick, hablando en nombre de la campaña Calcula los Costos, dijo: “Tras cincuenta años de guerra contra las drogas, con billones de dólares gastados, las drogas ilegales constituyen una de las mercancías más importantes en el planeta. Incluso la Oficina de las NN.UU. para las Drogas y el Delito, que supervisa en sistema global para el control de drogas, admite que los esfuerzos para aplicación de la ley sobre drogas han alimentado la creación de un vasto mercado criminal con desastrosas consecuencias negativas no intencionales. Ninguna región ha sido más afectada que América Latina. “Hay algunas contradicciones estructurales fundamentales en esta Guerra contra las Drogas… Nosotros en Colombia hemos sido exitosos, pero este éxito está dañando a toda América Central, México, el Caribe, África, y eventualmente regresará a nosotros. Por lo tanto, ¿estamos asumiendo la política correcta en el largo plazo? No tengo objeción a discutir ninguna de las alternativas, pero si vamos a discutirlas, hagámoslo con todas y cada una de ellas, ¿cuál es el costo?, ¿cuál es el beneficio de cada alternativa?”. Presidente Juan Manuel Santos de Colombia, The Washington Post, diciembre de 2010. La lista de adherentes a la campaña incluye a las siguientes instituciones: International Drug Policy Consortium; Harm Reduction International; Eurasian Harm Reduction Network; Drug Policy Alliance (EE.UU. ); Espolea (México); Release (Reino Unido); Fundación Transform Drug Policy (Reino Unido); Sindicato de Libertades Civiles de Hungría; CuPIHD (México); Instituto Transnacional (Países Bajos); International Centre for Science in Drug Policy (Canada); New Zealand Drug Policy Foundation; la Oficina en Washington para Asuntos Latinoamericanos; APDES (Portugal); PIE (Bolivia) y muchas más. The Count the Costs initiative is a global NGO project calling on Governments and the UN to meaningfully count the many costs of the War on Drugs, and explore alternative approaches that might reduce them. These costs are divided into seven headings - Development and Security, Public Health, Human Rights, Stigma and Discrimination, Crime, Environment and Economics. Briefings for each area are being produced throughout this year, as well as a growing archive of related reports, videos, images and articles. The Development and Security briefing is already available, as is a summary briefing looking at all seven costs. 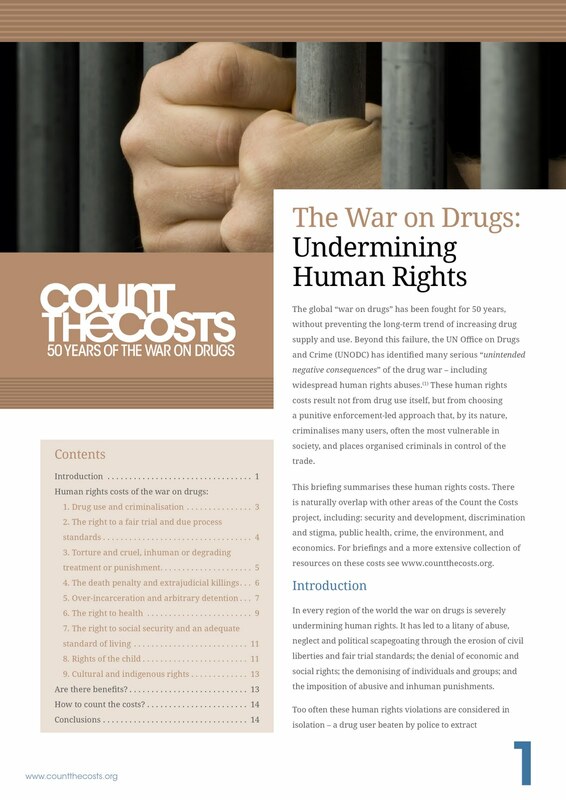 Today sees the publication of the next Count the Costs briefing - The War on Drugs: Undermining Human Rights - produced by several project supporters, including Transform, EHRN, Harm Reduction International, and Release. "In every region of the world the war on drugs is severely undermining human rights. It has led to a litany of abuse, neglect and political scapegoating through the erosion of civil liberties and fair trial standards; the denial of economic and social rights; the demonising of individuals and groups; and the imposition of abusive and inhuman punishments. Too often these human rights violations are considered in isolation – a drug user beaten by police to extract information; a drug courier executed by firing squad; a family killed at a military checkpoint; an HIV worker imprisoned for distributing harm reduction information; a family displaced by aerial fumigation of their crops; a drug user detained for years of forced labour and beatings on the recommendation of a police officer; a cancer sufferer denied pain-killing medicine. But they are not isolated. They are all a direct consequence of the war on drugs. Like the war on terror, the war on drugs is framed as a response to an exceptional, existential threat to our health, our security, and indeed the very fabric of society. The “Addiction to narcotic drugs” is portrayed as an “evil” the international community has a moral duty to “combat” because it is a “danger of incalculable gravity” that warrants a series of (otherwise publicly unacceptable) extraordinary measures. This is not an exaggeration of the political rhetoric. These words are enshrined in international law, including the 1961, 1971 and 1988 UN drug conventions.This crusading language has created a political climate in which drug war policy and enforcement are not required to meet human rights norms. In fact, despite being one of the three pillars of the UN’s work (along with development and security), these international agreements lack any obligation to ensure compliance with human rights. In over one hundred articles, human rights appear specifically only once (in relation to crop eradication)(4) – a staggering omission in treaties negotiated and adopted post-World War II, in the era of the modern human rights movement. This omission is now reflected in national law and policy worldwide. Through production, transit, sales and use, the responses to every stage in the supply chain of illicit drugs are characterised by extensive human rights violations, committed in the name of supply and demand reduction. In order to meaningfully count these human rights costs, it is necessary to not only see the connections between law and policy, and the effects on the ground, but also to make comparisons with what happens under alternative approaches, including the decriminalisation of the possession of drugs, and models of legal regulation. For example, most of the abuses resulting from a punitive, enforcement-led approach to illegal drugs do not occur in relation to the production, sale and use of tobacco, alcohol and prescription medicines. Ultimately, just as UN member states refer to “shared responsibility” for drug control, so too must they bear shared responsibility for human rights abuses perpetrated in its name. That is what Count the Costs is about – taking responsibility and openly evaluating all policy impacts, and all other options."